Entrepreneurship is recognized as a powerful driver of economic growth and job creation: it creates new companies and jobs, opens up new markets, and nurtures new skills and capabilities. Entrepreneurship makes economies more competitive and innovative and is crucial in achieving the objectives of several European sectorial policies. For this reason, one of the main recommendations (Action Pillars) by the EU Commission Entrepreneurship 2020 Action Plan (2012) is to promote entrepreneurial education and training. However, in the EU the uptake and the effectiveness of entrepreneurship education in European vocational schools are still far from being fully satisfactory. This is mainly due to lack of suitable materials and lack of skills in trainers. 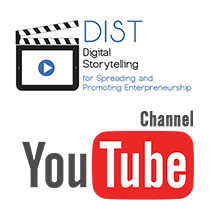 On the DIST YouTube channel 15 “VET videos” containing the young entrepreneurs’ interviews with their point of view on the main themes of entrepreneurship: creativity, problem solving, planning, time management … and 20 “Enhanced Full Videos” containing the young entrepreneurs’ interviews about their experience as a business person. Videos have captions in English but, using the YouTube tool “automatic translation” it is possible to have captions translated in several languages. The purpose of this guide is to provide indications useful for using, with the storytelling approach, video-interviews (produced with innovative successful entrepreneurs) for entrepreneurs and aspirant entrepreneurs training. To make this possible all the methodological information, content and theoretical framework to maximize the training effectiveness are provided. E-course addressed to trainers: the course is based on the content of the Guide Storytelling for Training and on the videos and will explain how to use the storytelling and the videos produced for developing the SIE to aspirant entrepreneurs and entrepreneurs. 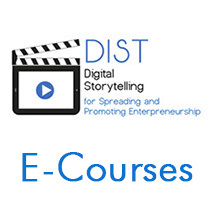 E-course addressed to aspirant entrepreneurs and entrepreneurs : the e-course referred on the content of the Guide Storytelling for Training and on the videos, explaining how to improve the SIE. 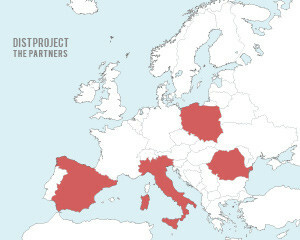 Every 6 months, a news release about the project progress, in partner languages and in English, have been published and sent to all the project’s stakeholder. © 2019 DIST Project. All Rights Reserved.